Corban Estate Arts Centre's latest solo exhibitions by John Parker, Liyen Chong and Dane Taylor features new works in ceramics, painting and printed images is on display from 2 August to 8 September 2013. Well known West Auckland ceramic artist, John Parker will present a new series in black, white and red, a colour palette that the artist believes encompasses New Zealand Aotearoa as an evolving nation. Parker’s works are typically recognisable as bottles or vases but he pushes beyond the traditional pottery vessel shape towards industrial minimalist forms. Artist Liyen Chong has built up a multi-disciplinary art practice dealing with cultural generalisations and issues. In Chong’s latest exhibition, Resolution she continues these cultural investigations onto reproduced images sourced from the 1960s and 70s. This new series of work developed after travelling to South Korea on an AsiaNZ Foundation artist residency in 2012. Auckland based artist Dane Taylor, also works on pre-existing images that he then overlays with complex painted kaleidoscopic abstractions. In Circle of Riffs, Taylor’s latest exhibition he continues to depict the interaction between abstraction and realism. In a series of free public programmes with the artists; Liyen Chong will run a workshop about migration on 10 August and John Parker will present an artist talk on 17 August, while Dane Taylor will run a kids art workshop on Saturday 31 August. John Parker, BLACK + WHITE + RED, 2013. Dane Taylor, Dear Violet, 2011. Liyen Chong, Ellipses elicit eligible elemental themes, 2013. Courtesy of Melanie Roger Gallery. The wharenui (meeting-house) is a universally acknowledged symbol of traditional Māori culture. Being the central focus of most marae, the experiences of the wharenui are memorable and significant. Wharenui are places of peace and growth, learning and understanding. This installation explores the artists shared and individual relationships with the concept of wharenui. Together they have examined some of the key functions of the wharenui, by creating two ‘whare-like’ interior spaces. Firstly the Whare Tūpuna (ancestral house) that looks backward into history and acknowledges the collective whakapapa; it shelters and comforts. Secondly the Whare Wānanga (house of learning) looks toward the future, enriches an awareness of the universe, teaches valuable skills and provides connections to community. As a collaborative art project installation the artists have a diverse, multidisciplinary approach which includes printmaking, weaving, and textile techniques. Printing and stitch craft, being traditionally European art forms, are used to render a distinctly Māori world view reflecting on biculturalism in Aotearoa-New Zealand. Rona Ngahuia Osborne’s (Clan Fyfe, Clan Caduggan, Kai Tahu, BFA Elam School of Fine Arts, Auckland University) textile moenga (beds) primarily references cultural and historical themes in Aotearoa, combining strong Māori imagery with colonial symbols, a reflection of Osborne’s own family’s heritage. Her blankets evolved out of the historical importance of blankets as objects traded by the European for Māori land. Implicit in Osborne’s work is an understanding about the mana (spiritual power) and the accumulated stories associated with handmade items that have been passed down. As an artist Alexis Neal (Te Ati Awa, MFA Slade School of Fine Arts, London) examines issues of cultural identity. In Whare Taonga, Neal investigates the form and traditional implications of whariki (floor mats). Whariki are customarily laid beneath the mattress of an overnight visitor of distinction, placed beneath a coffin during the tangihanga (funeral) as a mark of respect or at the birth of an important child. This whariki series honours such occasions. Neal combines printmaking with Māori weaving techniques to push the print medium into three dimensional works. This immersive installation moves beyond the re-creation of the aesthetic structure of the wharenui, celebrating the human presence within this extraordinary space. Viewers may choose to sit or lie on the beds, to make themselves at home and take in the space. Rona Ngahuia Osborne’s work primarily references cultural and historical themes in Aotearoa, combining strong Māori imagery with colonial symbols, a reflection of Osborne’s own family’s heritage. Her practice is based around the two central interwoven ideas of biculturalism and trade. 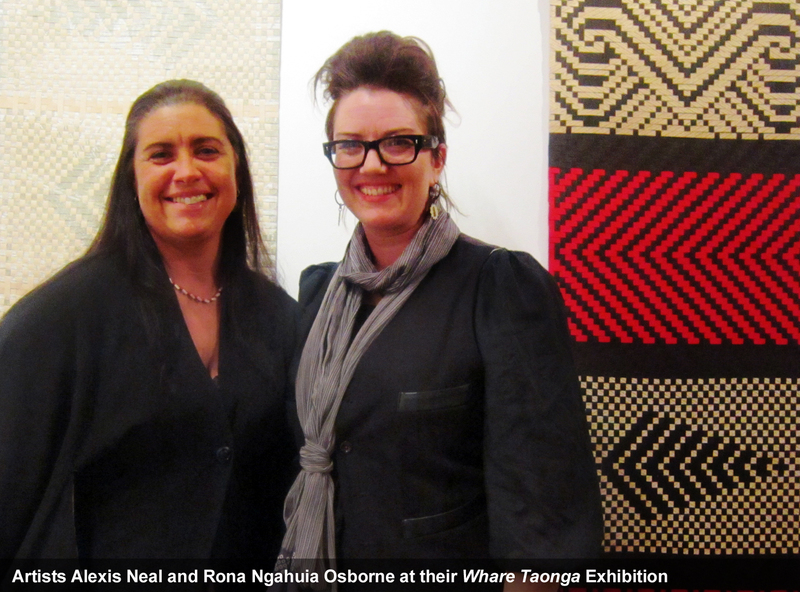 Rona Ngahuia Osborne holds a Bachelor of Fine Arts from Elam School of Fine Arts, Auckland University. As an artist Alexis Neal examines issues of cultural identity. In Whare Taonga, Neal investigates the form, function and traditional implications of the whariki (floor mats). Whariki are customarily laid beneath the mattress of an overnight visitor of distinction, placed beneath a coffin during the tangihanga (funeral) as a mark of respect or at the birth of an important child. This whariki series honours such occasions. In 2000 Alexis Neal gained a Masters degree from the Slade School of Fine Arts, London. The opinions expressed on the Project Space blog are that of the individual author. The Corban Estate Arts Centre is not responsible for the accuracy of any of the information supplied by the Project Space blog. Images and contents for each blog entry are copyrighted and are the property of the individual author.